Image is for illustration purposes only. Domes not included. 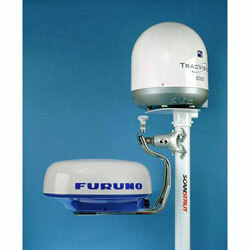 Our Dual Self Levelling Radar Pole Mount allows a dual installation of both radar and 30cm or 40cm satcom/tv antenna on the SC100 Pole Mount.The Self Levelling Mast Mount is fitted to the pole and a top platform supports the satcom/tv domes above the radar to ensure the best performance from both applications.